theCCRE encourages our web site visitors to participate in the "Loss in market value survey". When you have completed the survey and prompt the "Submit Input" button your opinion will be forwarded through to theCCRE. NOTE: The data developed through this survey will be helpful in determining the affect Loss of market value claims have in the industry. The more input received from more consumers the greater the weight that must be given to the survey results. For this reason we ask that all our visitors submit input only once and that each visitor invite at least three (3) other consumers to provide their respective opinions. Over the past several years the auto insurance industry has come to admit the validity of a financial damage referred to as "Diminished Value" or "Loss in Market value" (the amount by which the resale value of a collision repaired vehicle has been reduced from the amount it would otherwise have enjoyed had it not been involved in a collision). Now that insurance companies have admitted the existence of a Loss in Market Value due to the loss in general, many are attempting to deny the existence of any "D/V" or "Loss in Market Value" on individual cases and/or minimize the dollar value assigned to those claims. Until now, the amount of "D/V" or "Loss of Market Value" appropriate to each individual case has been resolved based upon the word of "Experts" working on behalf of the Insurer versus the word of Experts working on behalf of the consumer. We at theCCRE feel it has been inappropriate to have left the Consumer out of the "Loop" on this subject. This is your opportunity, as a Consumer, to provide your input. Following is described a factual situation about which you are requested to answer three questions as well as provide us with your e-mail address where we, or anyone validating the results of this survey, may contact you to verify your input. Assume, for the sake of this survey, you are in the market to purchase a specific retail vehicle that typically sells for $20,000.00. Your venture into the market place leads you to three vehicles that ideally fit your needs. All are comparable in Year, Make, Model, Equipment, Apparent Condition and Miles. All three units are available for $20,000.00. Vehicle "A" has No collision history and all original factory warranties will transfer to you. Vehicle "B" had incurred $6,000.00 worth of collision repairs per factory recommendations using new factory original (OEM) body parts. All original factory warranties will transfer to you. 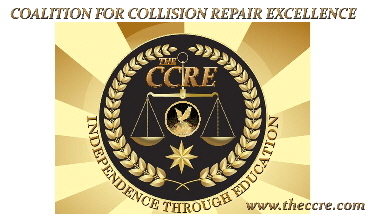 Vehicle "C" had incurred $6,000.00 worth of otherwise "proper" collision repairs but has "imitation" body parts installed on it. Only a portion of the original factory warranty will transfer to you. The original factory warranty will not cover the Imitation replacement body parts. All other factors are equal! 1. Would you be willing to pay the same price for each or any of these three vehicles? 2. What would the price have to be for you to give equal consideration to Vehicle "B"? 3. What would the price have to be for you to give equal consideration to Vehicle "C"? For your input to be included in our study data, you must enter your name and e-mail address above. Survey results data (not including your e-mail address or name)will be collected for use later in accumulative studies.